This stately residence is located on an expansive parcel along a landscaped cul-de-sac adjoining the Presidio Wall. Its walled private gardens provide a country ambience with bucolic, serene views over the Presidio Park and east city lights. 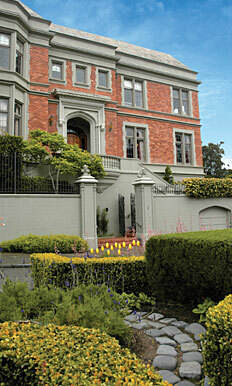 The house was designed by George Applegarth and built in 1928. 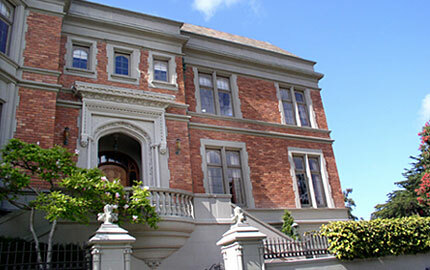 His best known works are the Palace of the Legion of Honor, Clift Hotel, Spreckels Mansion and a number of significant homes in Pacific & Presidio Heights. 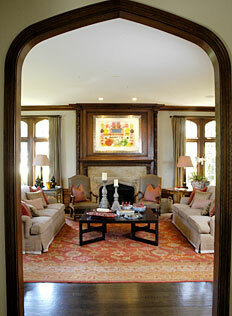 The renovation was headed by the prestigious firm of Thayer Hopkins Architects. Improvements were undertaken to respect the integrity of the original house while reconfiguring interior spaces for today’s lifestyle. The inviting Foyer echoes the neo-Classic theme found in the vaulted ceiling, tall arched doorways and elegantly arched leaded transom windows. The exquisite oval skylight above the semi-circular staircase provides an abundance of natural light and reflects off the handsome dark-stained hardwood floors throughout the public rooms. The beautifully proportioned Living Room adorned with deep crown molding and glorious center fireplace looks out to the landscaped south garden. The formal Dining Room features handsome square paneling and a new ceiling embellished with classic English plaster tracery found in the great historic houses of England. The spacious Kitchen/Family Room is now the heart of the house. It was transformed from a series of small rooms into a warm and generous space for today’s family-inspired style of cooking and socializing. The sunny breakfast area looks onto the garden and the open family room provides ample seating for conversation; convenient built-in office wall system. The original Arts & Crafts Batchelder floor accent tiles were preserved and reinstalled in the Gothic arched alcove backsplash. The floor is laid in Jerusalem gold limestone and stone surfaces are of exquisite marbles. 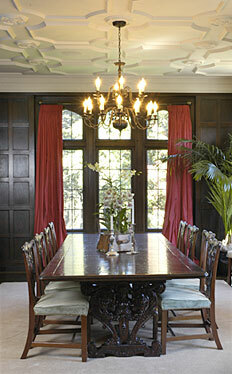 All details of the cabinetry, island and moldings by Mueller-Nichols are in keeping in the English style. A newly built interior staircase of Napa Valley cast stone provides convenient access to the rear patio/garden which enjoys east and west sunlight throughout the day. The Powder Room off the vestibule features a custom designed Saint Laurent marble vanity and silver leaf ceiling detail. 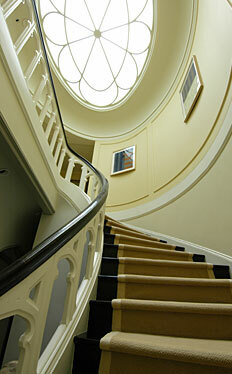 Ascend the gracious curved staircase with exquisite oval skylight to the bedroom landing. 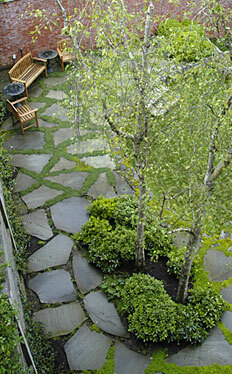 The Master Suite looks over the landscaped, south garden and receives splendid light from morning to evening. 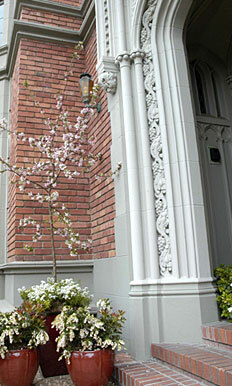 Classic Corinthian half pillars & stiles of scagliola marble provide an elegant accent. The spacious Master Bath features Jerusalem gold limestone surround, deep tub, double pedestal sinks, separate WC, shower and skylight. His & Her Dressing Rooms provide an abundance of wardrobe storage. The sunny southwest corner Bedroom adjoins a large dressing room & a full bath. The East Bedroom enjoys morning sunlight; adjoining remodeled Full Bath with Carerra marble surround. The handsome Library with fireplace can house an extensive book collection; the north balcony overlooks the Presidio greenery and the garden. A pair of built-in glass display cases open to the adjoining Study or Bedroom with west balcony and Presidio outlook. Full Bath in Murgiano marble. 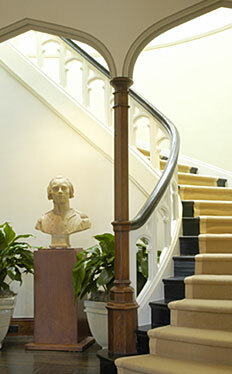 Newly constructed curved staircase leads to the lower level which once contained the original ballroom and unfinished utility and storerooms. The myriad of basement rooms were reconfigured and finished to the standards of the main house adding significantly to the liveable area. Spacious Multimedia Room with new stone fireplace; lowered floor for increased ceiling height and new light wells for additional natural light. Plant Room with slate floor, fossil limestone counter, custom copper sink, bar refrigerator and dishwasher; level walk-out to the delightful rear patio/garden. Mirrored Exercise Room, slate & limestone Bath with steam shower, and large Home Office with built-in cabinets & bookcases. 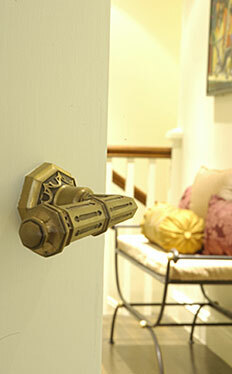 Handy Sewing/Wrapping Room, Wine Cellar, Boiler & Utility Rooms. 2 Car Side-by-Side Garage with inside access. The elegant landscaping and manicured hedges and trees beautifully complement and accentuate the home’s period architecture. The terraced rear garden is conveniently accessed from the front landing or from the lower level plant room for alfresco dining on the stone terrace and children’s play on the spacious lawn. The approved drawings for the house may be viewed on site.